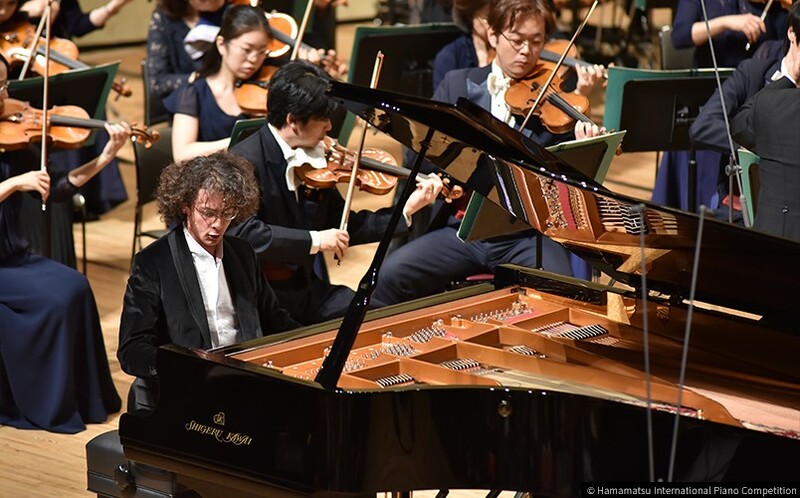 10th Hamamatsu International Piano Competition: 1st place prize winner Can Cakmur selects Shigeru Kawai SK-EX full concert grand piano | News | Kawai Musical Instruments Manufacturing Co., Ltd.
Turkish pianist Can Cakmur has been awarded the 1st prize by a panel of judges at the 10th Hamamatsu International Piano Competition (held in the city of Hamamatsu, Japan, from 8th until 25th November), following a series of performances playing the Shigeru Kawai SK-EX full concert grand piano. The SK-EX was also selected by a number of other prize-winning contestants and finalists. Kawai has provided instruments for official selection in the Hamamatsu International Piano Competition since the inaugural event was held in 1991, with top prize winner Victor Liadov selecting the Kawai EX concert grand piano at the 2nd competition held in 1994, and top prize winner Alexander Gadjiev selecting the Shigeru Kawai SK-EX concert grand piano at the 9th competition held in 2015. A total of 382 pianists from around the world applied to compete at this year’s 10th competition, with 88 participants selected to perform. Following three stages of qualifying, the final round was contested by 6 participants, with the first prize awarded to Turkish pianist Can Cakmur, who selected the Shigeru Kawai SK-EX full concert grand piano throughout the competition. Fifth place prize winner Keigo Mukawa (Japan) and Sixth place prize winner Takashi Yasunami (Japan) also selected the Shigeru Kawai SK-EX throughout each round of the competition. As one of three piano manufacturers’ instruments available for official selection, the Shigeru Kawai SK-EX proved popular among contestants throughout the competition. In the first round, 28 of the 88 participants selected Kawai, followed by 6 out of 24 contestants in the second round. Of the remaining 12 participants that reached the third round, 4 pianists selected Kawai, while the final was contested by 6 individuals, 3 of whom performed using the SK-EX.